I have read and tried every combination possible but can't get the balance or feel right. 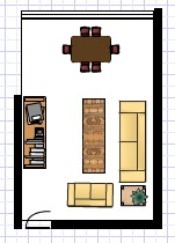 My living/dining room is only 9' 6" x 14' 6". As you enter, the only unbroken wall is on the right and is 14' 6". Facing, on the short wall are patio doors for the entire width of 9' 6". To the left is a 5' opening to the galley kitchen followed by the remaining 9' wall returning to a 6' wall back to the doorway from the hall. I love a minimalist look and have a dark brown two seater sofa, a long beech TV unit, a small beech side table plus a horrid pine square dining table! It always seems unbalanced what do you suggest? Based on the measurements you have given me I have done my best to come up with a furniture arrangement which will work for your living/dining room. Without having all the exact measurements I can't be sure of course but I think this may work for you. You need to have clearly defined eating and seating areas and it makes sense for the eating area with the dining table to be at the end of the room where it can be opposite the opening to the galley kitchen. Your seating and TV area will naturally be at the other end of the room. You will see that I have added an additional small sofa in this area and I think it is something you should really consider. Do you often have friends over? It is hard for people to chat when sitting in a row so I would recommend you get a second sofa or an armchair which can go at 90 degrees to your two seater sofa sofa making comfortable and relaxed conversation easier.